The European Handball Federation has signed an official partnership agreement with the International Sports Press Association (AIPS). The European Handball Federation has signed an official partnership agreement with the International Sports Press Association (AIPS), which will see the two organisations co-operate to present the sport of handball to an ever increasing audience. Secretary General of the European Handball Federation, Michael Wiederer, signed the agreement on behalf of the EHF President, Tor Lian, at the AIPS Sports Integrity Symposium in Lausanne, Switzerland on Thursday 27 January 2011. 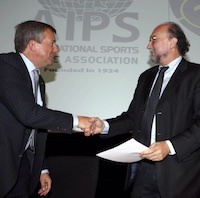 AIPS President Gianni Merlo signed the agreement on behalf of the International Sports Press Association. The one-day AIPS symposium, held at the Olympic Museum in Lausanne, was opened by President of the IOC, Jacques Rogge, and attended by some of the world’s leading sports journalists and representatives from international sports federations. Commenting on the new partnership, EHF President, Tor Lian, said: “I am delighted that the EHF is to become an official partner of the International Sports Press Association. We have worked closely with AIPS for many years, in particular in the area of media management, and there is a great synergy between our two organisations. I am sure that this partnership will enable the EHF to gain still further from the expertise and extensive contacts of the AIPS within the sports media world. AIPS President Gianni Merlo said: “I am extremely pleased to be able to welcome the European Handball Federation as an official partner of AIPS, there is a huge and growing media interest in handball both in Europe and around the world, and I am sure that our partnership will bring both fruitful and positive results for both AIPS and the EHF. The partnership will enable the EHF to promote its work and major events such as the Men’s and Women’s EHF European Championships and the VELUX EHF Champions League FINAL4 through its extensive media network as well as online at aipsmedia.com and through the AIPS Magazine. There will also be joint initiatives to further improve the services and working conditions offered to the media by the EHF. AIPS (Association Internationale de la Presse Sportive) is the professional body representing sports journalists worldwide and is recognised by the International Olympic Committee (IOC) as well as all of the leading international sports federations. AIPS has 10,500 members in 150 countries, representing the leading international daily newspapers, periodicals and radio and television channels across the five continents.